Echocardiography allows accurate, rapid, non-invasive diagnosis of heart disease but is not available in many underserved populations. Nascimento and colleagues1 in Brazil tested the hypothesis that telemedicine interpretation of a focused handheld echo study performed by a healthcare provider with condensed imaging training could improve delivery of cardiovascular care to patients in low-resource areas. Remarkably, echo screening of 299 asymptomatic primary care patients identified significant heart disease in 35%, with a higher prevalence of disease in older patients (figure 1). Comparing screened patients to the 705 patients specifically referred for echocardiography based on clinical symptoms or signs, moderate-severe left ventricular systolic dysfunction was observed in 4.1% vs 8.1% (P=0.03), mitral regurgitation in 8.9% vs 20.3% (P<0.001) and aortic stenosis in 5.4% vs 4.3% (P=0.51). Prevalence of echo-diagnosed heart disease was highest in those over age 65 years. Echocardiographic prevalence of major heart disease requiring priority referral based on the final conclusion of the expert readers, according to study group. AV, aortic valve; MV, mitral valve; LV, left ventricle. Peters and Patil2 comment that “Cardiac point-of-care ultrasound (POCUS) has been rapidly adopted across a variety of practice settings. The popularity stems from the ability to rapidly assimilate findings at the bedside into a diagnosis and treatment plan." The study by Nascimento and colleagues1 is remarkable for the number of patients included, having non-cardiologists perform image acquisition, developing a concentrated imaging training programme and using telemedicine for expert image review. They conclude: "Through high-quality cardiac POCUS, the healthcare community world-wide has a promising new resource to diagnose heart disease." Discharge against medical advice (AMA) occurs for several reasons, such as lack of trust, poor communication, financial worries, and patient dissatisfaction. Discharge AMA is a particular concern in patients with acute myocardial infarction (AMI) given the known benefits of medical therapy post-discharge. In order to estimate the magnitude of this problem, Kwok and colleagues3 looked at data on over 2.6 million patients AMI in the USA National Readmission Database from 2010 to 2014. Overall, the rate of discharge AMA was only 1.5%. 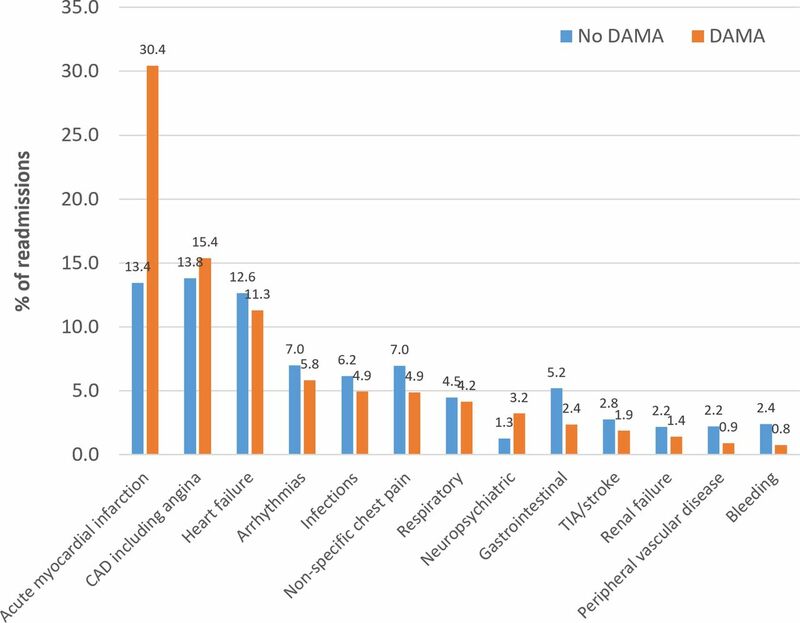 However, discharge AMA was associated with a higher rate of 30 day hospital readmissions both for all causes (OR 2.27 95% CI 2.14 to 2.40) and for AMI. Crude readmission rates for AMI were 30.4% vs 13.4% with a greater than 3-fold increased risk in those discharged AMA, even after adjustment for other variables, (OR 3.65 95% CI 3.31 to 4.03, P<0.001) (figure 2). Causes of 30-day unplanned readmissions. DAMA, discharge against medical advice. There is increasing use of a left ventricular assist device (LVAD) to stabilise patients with end-stage heart failure who are awaiting heart transplantation. In this issue of Heart, Parameshwar and colleagues5 summarise the UK experience in the 342 patients who were treated with an LVAD between 2007 and 2013 in whom the median duration of support was 534 days. At 3 years follow-up, overall survival was 49.6% with a cerebrovascular accident being the most common cause of death during LVAD support. Only about 25% of patients received a heart transplantation with even fewer able to have the device explanted without heart transplantation (figure 3). 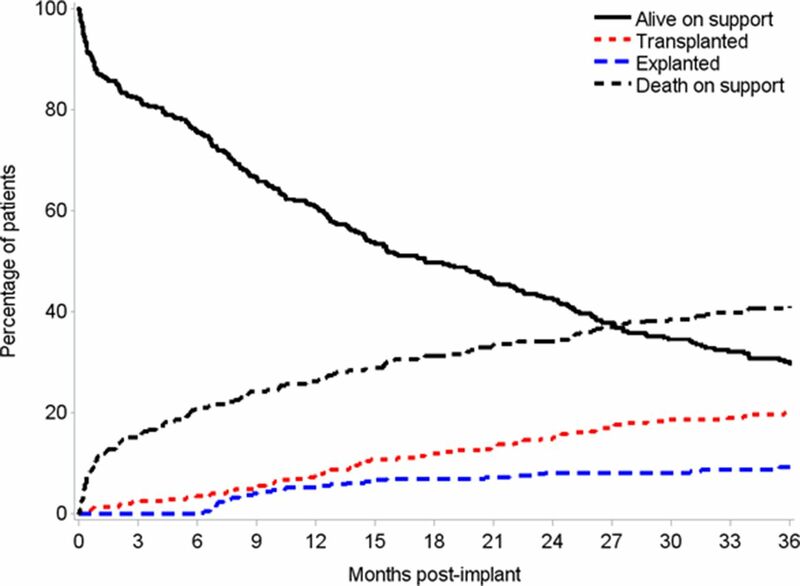 Cumulative incidence of death on left ventricular assist device support, heart transplantation and explant without transplant. In the accompanying editorial, Li and Mahr6 put this data in context. Heart transplantation after placement of an LVAD occurred in only 25% of these UK patients at 3 years, compared with US registry data showing transplantation rates of 50% at 2 years Although overall stroke rates appear similar in the UK and USA after LVAD implantation, stroke accounted for only 18% of deaths in the USA registry compared with 35% in the UK data. However, they go on to suggest that with the increasing use of LVADs despite no change in heart transplantation rates, the UK experience may be the future for the USA as well. They conclude: “It is our opinion that a deliberate and proactive effort to research and implement optimal medical management strategies to reduce LVAD complications, especially strokes, is urgently needed." The Education in Heart 7 article in this issue provides an excellent discussion of the definition, pathophysiology, clinical outcomes and management of patients with diabetic cardiomyopathy (figure 4). 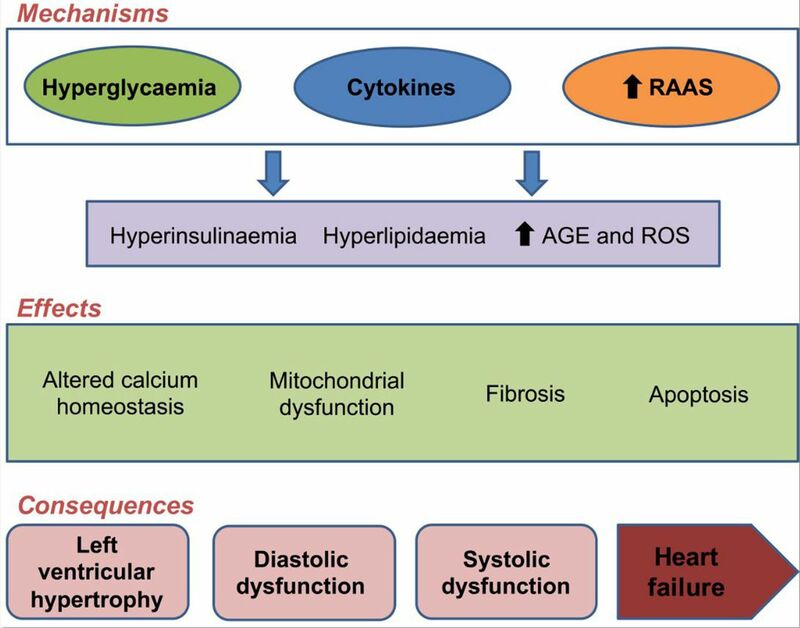 Potential mechanisms, effects and consequences in diabetic cardiomyopathy. AGE, advanced glycation end products; RAAS, renin–angiotensin–aldosterone system; ROS, reactive oxygen species. The Image Challenge 8 question shows an abdominal computed tomographic scan in a young woman with known congenital heart disease (ACHD) who presented with abdominal pain. As more patients with complex ACHD survive to adulthood, general cardiologists will need some degree of familiarly with long-term complications because these patients often will present acutely to the local medical centre.
. Discharge against medical advice after hospitalisation for acute myocardial infarction. Heart 2019;105:315–21.
. Diabetic cardiomyopathy. Heart 2019;105:337–45.
. Acute-onset abdominal pain in a woman in her 30s. Heart 2019;105:275.